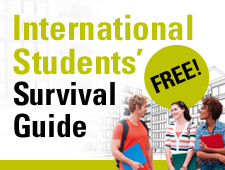 The International Students’ Survival Guide will soon be available in free downloadable chapters released each month. Watch this blog for more details soon. Suitable for all international students with specific information on Australia, the UK, and the US. Language is graded to CEF level B2+ / Upper Intermediate with COBUILD definitions of the most difficult words. This entry was posted in Students on May 14, 2014 by admin.